Ever since the tournament's inception in 2003, I've always wanted to play in Gibraltar. It's not that often that a new, strong Swiss tournament appears on the calendar (apart from the Aeroflot Open, which has been running annually since 2002, I can't think of another example), and this one held the additional appeal of being in a rather unusual, little known destination- when I mentioned to people that I was going to Gibraltar, quite a few had never heard of the place, and most had a very vague idea of where it was. As for myself, I doubt I would've made it out there were it not for the chess. Oh, yes, I'll admit the other reason I was always drawn to playing in Gibraltar: every time I would visit the tournament's website in previous years, the first thing I'd see on the homepage would be a picture of the Gibraltar apes 'playing chess'. (Wow! How exotic! must have flashed through my mind.) What can I say, I'm a sucker for animals. But since Gibraltar was always held in the last two weeks of January, coinciding with the start of my college winter semester, I could never make it there. 2007 was my first chance- I graduated in May 06- and it was actually a very opportune moment to go: the women's prize fund had been increased significantly for this year, with a first prize of almost $8000, $4000 for second, $3000 for third, etc. These kinds of prizes for women are groundbreaking; Gibraltar is really a unique tournament in its attitude towards women players. The organizers want to attract more top female players to their tournament, and they've recognized that increased prizes are the way to do that. This year, eleven women from the world's top fifty participated in Gibraltar, including Pia Cramling (the top women's seed at 2530, she's played in every edition of the tournament), two former Women's World Champions, Antoaneta Stefanova and Zhu Chen, and the young 2005 European Women's Champion, Kateryna Lahno. The overall lineup was very impressive as well: England's best player and member of the world's top ten, Michael Adams, led the field (at the beginning, not the end! ), followed by an integral member of the gold-medal winning Armenian team of the 2006 Olympiad, Vladimir Akopian, and a bevy of seasoned pros hovering around the 2650 mark: last year's winner, Kiril Georgiev; the man who famously defeated Kasparov in Wijk aan Zee in 1999, Ivan Sokolov; and our own 2005 U.S. Champion Hikaru Nakamura. What's missing from this lineup? A chess legend? No, Victor Korchnoi was there as well. The field was top-heavy in Gibraltar. Seed #1 Michael Adams (2735, right) with Jaan Ehlvest, seeded 14th at 2610 FIDE. If this hasn't given you a good idea of the strength of the tournament, I'll just throw in that, at 2449, I was ranked forty-third going in! I chose the solid-looking 4.e3, and one could say that the first critical decision of the game was taken on move 8, when he captured on c4 with the pawn instead of the bishop. Actually, it was quite a typical moment: the higher-rated player feels pressure to win and thus strives to keep the game complicated almost at any cost. That kind of thinking suited me fine: it can be hard to get interesting positions, with an acceptable amount of risk, when your theoretical knowledge is less than your opponent's, so if your opponent takes it upon himself to make it interesting, you can only welcome that. Anyway, from that moment on, I was happy to be playing White, though further down the line I still faced some tough decisions about how to develop my initiative and show compensation for the pawn deficit. 13.h4!? and 15.Rh3!? were key components of my strategy (15.Rh3 may look obvious, but I spent a lot of time on 15.g4). Pretty soon, without doing anything obviously wrong, Black's position started to look like a disaster (let's say around move 18). All my pieces were well coordinated, ready for the final assault on Black's king. I thought the win was really close- and it was- but I walked by it twice, on move 23 (missing 23.f4! dxe4 24.fxe5 and Black's position is indefensible) and on move 25 (25.Bd4! Ra-e8 26.Re3 pins and wins the knight). I had made natural-looking moves, but they weren't good enough, and when I started thinking on my 26th move, I realized that nothing was left of my winning position. In fact, although I might still have been okay, the dynamic of the game had changed completely, forcing White to defend, while Black's next few moves would be obvious (just bringing the knight on b7 into the game with Nd6, threatening forks on e4 and f5). Psychologically, it was really hard to play, looking for ways to keep my position together, when I knew I had been winning just a few moves ago. I decided I couldn't tolerate the knight on e5, so after spending almost all my remaining time, I went for the slightly crazy looking 26.f4 (not as bad as it looks) and the game set off on a new, chaotic, time-pressure riddled stage. There was a funny moment when, unable to find a reasonable move, I played 28.b4?!?! followed by a move completely on the other flank, 29.Bf3. far I had calculated; it looked fine for White but Black has the surprising: 31...Rg5! !- not so obvious to a human since Black is just down a piece for now- 32.fxg5 Nd6! and and the threats of ...Ne4 and ...Rxe6 are just too hard to meet. In all honesty, this line wasn't that easy to find. He went for the natural 29...Nc5, but just like my natural moves hadn't been good enough earlier, …Nc5 wasn't sufficient for an advantage either, and after a forced sequence of moves, we wound up in an equal queen endgame by move 40. I thought the draw was not far off, but made sure to be precise with my queen maneuvers (ie: 41.Qe4 was a good move, as my queen is well-placed on the a8-h1 diagonal). The final critical moment occurred just a move later, after 42.Qd5+. Position after 42.Qd5+, in which Akopian faltered. I was expecting 42...Kf8, moving towards the passed e-pawn, when a perpetual will conclude the game (either by me or by him- if I try to push my pawn with 43.Qd8 Kf7 44.Qd7 Kf8 45.e6 Qe3+ and my king can never step on the d-file because of …Qd4 trading queens (his king is too close to my passed pawn), nor can he find shelter from checks on the kingside). 42...Kh8? essentially decided the game- instead of giving a perpetual, I just advanced my passed pawn, and used his pawns to cover my king as he moved up the board. I'm not sure if Black is absolutely lost after …Kh8, but it's definitely a depressing task for a human to defend that position, trying to calculate the results of the various queen checks. The game was a bit ironic- instead of winning at the moment that I truly was winning, I drove my position to the edge of a cliff, and finally won out of nothing, due to an inexplicable blunder by him in an equal endgame. But all in all, it was a satisfying game, containing everything: opening, middle game, endgame. Akopian, by the way, recovered pretty well after this: he gave up only half a point more (to Zhu Chen- rather amusing- he only lost points to women) en route to his final score of 7.5/9 and clear first place. And he created some very fine games as well, showing impressive preparation in the Meran against Dean Ippolito, outplaying Ivan Sokolov in a positional style in the penultimate round, and crowning it all off with a beautiful piece sacrifice against Ukrainian youngster Yury Kuzubov in the final game between the two leaders. Hikaru actually had a similar path to his final score of 7/9, which put him into a tie for 2nd place with Emil Sutovsky and Alexander Areschenko (another young player from the Ukraine). He started off with a loss to Georgian IM Ketevan Arakhamia, but then reeled off a string of wins, only drawing with Black against GM's Roiz and Efimenko. Given his loss in the first game, I think that Hikaru can be pleased with his ultimate result and his prize of $8500. But that's not the only prize Hikaru picked up in Gibraltar! Hikaru participated in all the 'extracurricular' activities offered by the tournament, from a team blitz tournament (his team finished second) to a pairs tournament (the average of the team could not exceed 4600; in this event Hikaru and his partner didn't fare so well, but it was a lot of fun…especially for me to watch) to the poker tournaments at the nearby casino. The night before the last round Hikaru won a poker tournament at the casino and a cool $2000 payoff, a good omen for the final day. Hikaru Nakamura played in everything he could in Gibraltar! Hikaru considered the following crushing miniature against Vladimir Epishin to be his best effort from the tournament- at the end of the game, Hikaru had 1 hour 20 minutes on his clock, exactly the amount he started out with (meaning that, with the 1 minute increment, he used 24 minutes for the game). Interestingly, when I asked Hikaru what he concentrated his attention on on the way up, he said, "openings, openings, openings" because "the game is decided in the opening". Krush was delighted to play (and defeat!) Korchnoi, but not so happy with the post-mortem. I guess you could say that the other highlight of my tournament was my game against Korchnoi in round 8; certainly, playing someone who's been battling it out with the world's best players since the 1950's is a special opportunity. He's the only link left between that bygone chess generation and today, and I've always found his example inspiring. At 75, he's still traveling (someone told me that he said that after this tournament he was going home to "change suitcases" before moving on elsewhere), still playing chess, and what's more, he still cares a lot about his results. The downside to that last point is that he's known to be quite disagreeable to his opponents after losing, saying things along the lines of 'before this game, I knew you were a terrible player, but now I see that you don't understand chess at all', etc. My game with Korchnoi ended rather unfortunately. On the move before the game ended, he played 26.Qc5, setting up a very nasty trick of winning my queen with Bd5 and Rf8+ check or…Rf8+ and then Bd5, pinning the queen. Now I could just defend against both of these ideas with 26...Ne7, after which the game would be balanced, but after a too-brief think, I played 26...g6?, defending against only the 27.Bd5+ move order, since I could just take the bishop and on Rf8 play Kg7. Immediately after playing it, I realized that he could start with 27.Rf8! and either I give up the queen for a rook and bishop, or after 27...Kg7 I drop pawns after 28.Rxd8 Nxd8 29.Qxc7. Here he thought for about fifteen minutes, and came up with the lemon 27.Rf2??. The funny thing about this move is that I had noted a while back that the rook is not well-placed on f2, since it allows all kinds of back-rank mates, and now all I had to do was to remember that mental note and find 27...Qxe4! So it was a sudden, and really unfortunate, end to the game. I wasn't happy about winning due to such a blunder. He seemed pretty disgusted with himself, signed the score sheet, and left the playing area without saying anything. I was glad to have escaped his wrath, but a few minutes later I encountered him in the lounge/analysis area of the hotel, where I had come to show Elisabeth Paehtz the position that could have arisen had he correctly played 27.Rf8: Did I have any chances there with my rook and bishop? Ah, seeing me there looking at the game was like waving a red flag in front of a bull. The first thing he said was "I could have had two extra pawns! ", then he would suggest some move and walk away, only to come back in a minute, and all this interspersed with insults such as "it's good to know theory, but you should learn how to play chess as well" (unfortunately, even the insults were not helpful- what theory? I was playing the White side of a Scheveningen with a tempo down, and I definitely did not feel very comfortable in the opening). Finally, it came down to this: he suggested a move, and Elisabeth suggested a (stronger) alternative, both moves were quite simple, nothing special. Elisabeth Paehtz from Germany, caught in the Korchnoi-Krush crossfire. So he says, about Elisabeth's suggestion, "no, this move is too good for her." I look up at him, waiting for the inevitable "she doesn't deserve this" which duly came. And really, that was just too much for me. What is that supposed to mean, that a move is too good for a person? "Why do you have to be so unpleasant?" I asked. I was incredibly angry. He sputtered something and walked away, this time for good. As you can see, it wasn't exactly a 'highlight' moment for me, on the level of my game with Akopian- I guess I just don't like having abuse poured on my head. In a conversation about this episode over dinner that night, Greg Kaidanov tried to get me to view his behavior as part of what makes him great- if he wouldn't get so upset about losing, he'd never maintain the level that he has. I see his point, but somehow I can't accept the idea that these sorts of verbal assaults on people are justified, no matter what their end goal is. But on to more pleasant things! My best day in Gibraltar was undoubtedly the day of the seventh round, when I left the hotel for practically the first time, and went to visit those same apes that had tempted me into coming to Gibraltar. I had great company in Ian Rogers and his wife Cathy, as well as my fellow Americans Greg Kaidanov and Dean Ippolito. It was just incredible fun, seeing the apes up close, watching them climb onto the windshield and roof of our car, posing for pictures with them. It's exhilarating and also a little bit scary being so close to them, as they are wild animals after all (one bold ape tried to tear Dean's shirt off; I guess he figured out which one of us goes to the gym most often). This well-spent morning put us all in a good mood, and the four of us won our games that afternoon. Dean Ippolito, Irina Krush gearing up for the afternoon round. It's probably time for me to wrap up this article, so I'll just add that in the end the top women's prize was shared by my roommate, Jovanka Houska, and Antoaneta Stefanova, who both won their last round games to finish with 6/9. Zhu Chen and I, who were half a point ahead going into the final round, lost to Ehlvest and Sandipan, respectively (coincidentally, these two work together). The final result must have been very disappointing for Zhu Chen, who played eight (!) GM's consecutively after receiving a free point by default in the first round. Just to illustrate the rather absurd distribution of the prizes, Zhu Chen played an average of 2596 and gained 13 rating points, while the winner of the big money, Antoaneta, played an average of 2306 and lost 4 rating points. (Ed.Note-Irina's own performance rating was 2563) It doesn't seem quite fair, somehow, but that's the way these systems work; everything comes down to the final round, and it's usually better to be coming from behind. Irina's roommate and co-winner of the women's prize, Jovanka Houska. I don't have anyone or anything to blame for this loss; I voluntarily went for a sharp position, and didn't manage to work through the ensuing complications. I'm glad that my roommate, Jovanka, had such a sweet finish, though- I didn't know her prior to this tournament, but I had a good feeling about her, and it turned out that my hunch was right on target- she's a very nice person. 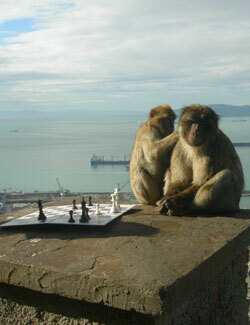 Keep an eye out for Ian Rogers' report on Gibraltar, scheduled for the April issue of Chess Life Magazine.